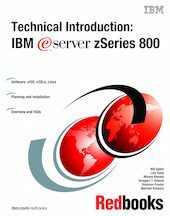 This IBM Redbooks publication describes the IBM eServer z800 family of systems. These are IBM machine type 2066 systems, with a number of different models. The z800 systems are smaller but quite similar to the well accepted z900 systems, often known by their development name as the "Freeway" series. Consequently, the z800 machines are sometimes characterized as "baby Freeways." This is close, but not quite accurate. The z800 machines offer a lower entry point, in both price and performance, than the z900s, but have a few characteristics that differ from the larger systems. z/OS.e is a special packaging of z/OS that is unique to the z800 machines. It is a reduced function z/OS with a significantly lower price than full z/OS. z/OS.e is targeted at new workloads based on e-business constructs, using C, C++, and Java languages and working with WebSphere, DB2, and similar middleware. Traditional workloads cannot be run with z/OS.e. This book is for readers with a general S/390 and z/OS background; common terms and acronyms are used without introduction. Also included is a limited amount of introductory material for Linux users who are not familiar with S/390 platforms. The goal of the book is to provide a technical introduction to the z800.